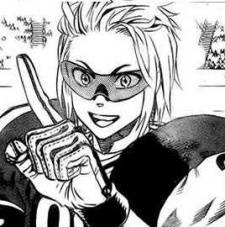 Doujirou Tenma is the former ace Runningback on the Shinryuuji Nagas and was one of the two people to get into Shinryuuji through the sports program along with Yamabushi. He was recruited into Teikoku to join their football team. He is called "The Sideline Edge's Magician" because he is able to run on the sidelines really close at high speed without losing his balance or momentum. He also has 5 girls who are head over heels for him. Doujirou also likes listening to his music when he is playing during the game. Trivia from Volume 33 character data: Got his first girlfriend when he was 3 years old. Immediately regretted joining the all-boys school of Shinryuuji and transferred to Teikoku three days later.